Dedicated to Snowwhite6210 and to child_dragon, whose story I loved as a kid and was partial inspiration for this one. My name is Oyer, and in Meridell I was born. When I hatched in the Draik Nest, I was all alone. It was dark and creepy and I didn't know what to do. I didn't even know what or who I was, or why I was there alone. So I decided to nap for a while in a dim beam of light that descended from the roof of the cave. Hatching is hard work, after all. The light's warmth seemed to cradle me in its arms as I slept. When I woke, the light was shining much more brightly and as my eyes adjusted, I saw something glinting in the corner of my eye and went to investigate. It was a shallow pool of water. And I could see myself in it! I was small and red with large wings and a rather confused look on my face. What was I? Eventually, not knowing what else to do, I decided to follow the comforting light that had been keeping me company in the lonely darkness to its source. I had hoped that it would lead me to a warm, friendly place. I jumped toward it and instinctively began to flap my wings, flying for the first time. When I emerged from the cave, chaos seemed to envelope me. The light was blinding and the noise was unbelievable. There was so much shouting and cries of pain and anguish! I covered my ears, but it could not block the noise. I was confused and scared so I panicked and tried to fly away quickly. "Get out of the way!" Suddenly, a blue creature that looked just like me winged past at a blinding speed, knocking into me as it flew by. It hurt and caused me to falter in the air. My eyes were stinging and, suddenly, I just wanted to be back in the dark, little cave. When I tried to turn and flee back to my safe nest, a small object collided with me and sent me spinning into the hard ground. I cried out in pain and terror as several scary-looking pets surrounded me. Under their fierce gaze, I began to cry. I was so confused and did not know what I had done wrong to deserve everything that was happening. "It's just a hatchling," one of them, an evil-looking red creature with whippy ears (which I learned later was a Gelert), snarled, poking me with his stiff boots. "We should just leave it here." There were murmurs of agreement and they began to leave me, but a large, beaked, purple creature continued to stare down at me. Everyone else paused to wait for him, with confused looks on their faces. "What is your name, little Draik?" He asked me, his quiet voice reassuring. I squirmed under his scrutiny for a moment before I could bring myself to answer. "I... I don't know." When I thought about it, I really had no idea. I had never met anyone else, so it had never occurred to me to call myself anything. He continued to gaze at me for a moment, before turning to the others. "This little hatchling could be quite useful to us. He is young and can be taught our ways. Furthermore, he looks like he belongs here. No one would suspect him. We could send him into the enemy's ranks as a spy." I wasn't really sure what he was talking about, but it seemed like good news to me. Many of the other pets did not look convinced, but they did not argue with him. He reached toward me and I allowed myself to be scooped up. There was just something about him that I trusted. I soon fell asleep in his arms, feeling quite safe. When I woke, I was no longer in the bright, green world I had been. I was in a dark castle. I could see nothing but starry skies out of the numerous windows. I was alone, but unafraid. I sat still for quite some time before someone came into the chamber in search of me. We stared at one another for a moment. 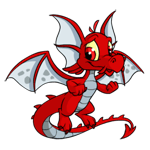 He was a Draik too, but was purple and grey, in contrast to my red. Finally, he bent one long, clawed finger at me and bade me follow. I was sure I could not keep up when finally he came to rest by a large window. Then, suddenly, he leaped effortlessly out into the night. Judging by the proximity of the clouds, we were a long way up and I had barely flown before. Yet I knew he'd think me a coward if I didn't try... I had to do it. So I gulped, swallowed my fears, and leaped into the air after him. It was even higher than I had expected and, for a moment, I was falling, stricken with panic. I could see the purple Draik watching from above. The smug look on his face told me that he was sure this would happen. He did not think I could make it. I had to do something- I had to prove myself! So I steeled myself and spread my wings. I managed able to catch an updraft and wing clumsily over to him. His smile softened just a little and he allowed me to fly by his side. We talked for many hours about where I was, how things in Neopia were and what my job was to be. Apparently I had hatched during a war between a land called Meridell and one called Darigan Citadel. The one who took me in was Lord Kass, a Darigan Eyrie. He was the current ruler of the land and the commander of the Darigan Citadel Army. Draiks were not usually hatched alone, the Draik said, and no one could account for me. But Lord Kass took me in. He gave me my name, Oyer, and, over the next few weeks, he made sure that I was taught everything that a young Draik should know. He also made sure I was taught the art of battling and that of being a spy. Apparently, I was to be my job to sneak into Meridell and learn all their battle plans. It was an exciting-sounding job and something I greatly looked forward to. I did not see much of Lord Kass, however, as he was the busy commander, after all. Yet when I did, he was always kind to me and treated me as a son. Eventually the day came that I was sent into Meridell castle to do my job. I pretended I had come from a distant land and that I was there to help them in their war. No one suspected my true identity and I came and went for many months. During the time I was there, I was able to report everything I heard back to Lord Kass. I was able to blend in perfectly in Meridell and everyone began to trust me immediately - even their king. And when their plans went wrong, no one suspected me. I helped our army so much that it seemed we were going to win the war. Lord Kass couldn't have been prouder of me. But in the end, it wasn't enough to win after all. I remember those final days clearly. The final day of the war, I was approached by a blue Lupe while in Meridell castle. He introduced himself to me as Jeran. Then, "you don't have to do this, you know," he said while studying me in a very disquieting way. It was as though he was looking into my soul and could see me exactly as the spy I was. "I don't know what you're talking about." I retorted, giving him a fierce look, but he did not back down. He continued to gaze at me and after a time, he sighed. "How have they corrupted you so, young one? You should not follow this path of darkness. You should follow the path of light." This confused me. I did not know of his path of darkness or his path of light. I was just here doing my job. I was not on any path at all. Yet, when I thought about it, if I had the choice between the two, I would have chosen his path of darkness, simply based on their names. I still remembered the horrible path of light that had led me to this cruel world in the first place. By the time I was done gathering my thoughts, the Lupe was gone. Eventually I flew home, not realizing the Lupe was secretly tailing me. I unwittingly led him straight into the castle and ruined everything. I guess you could say I single-handedly handed Meridell their victory. I headed straight to Lord Kass' chambers and was admitted immediately. I noticed an Aisha and Blumaroo locked up in a corner of the room, but I ignored them. Prisoners were nothing new to me. "Ah, Oyer, child," Kass beckoned to me and I came to sit by his side. He listened as I told him that I heard in the castle that Meridell was in full retreat. Eventually I got to the part about the blue Lupe named Jeran. "But I don't know what he meant, father," I trailed off, noticing the inscrutable look on his face. Suddenly, he leaped up and grabbed my hand. He went to pull me toward the door, but stopped suddenly, dropping my hand. He was looking over my shoulder back they way I had come and I could tell immediately that something was wrong. He glanced back down to me, a sad smile on his face. "No matter what happens now, Oyer, I want you to know that we are proud of you and that this was never your fault. When you are older, you will understand. I am so sorry." His eyes had a sad, haunted look as they looked into mine and I began to get scared. I didn't know what he was talking about. "Now, run," he yelled at me, shoving me away from him. He leapt into action and pulled a giant sword from its scabbard at his waist, moving in front of me. "Run!" he repeated and, startled, I scurried to hide by the door. When I looked back, I saw the blue Lupe standing in front of the person who had taught me so much, who had raised me as his own son. Suddenly, the sounds of battle started to echo throughout the castle and I huddled close to the wall. "So, here we are, Jeran." Kass now spoke to the Lupe. "You knew this had to end eventually, Kass," was his reply. Wasting no time for heroic speeches, Jeran lunged into action with his sword and then two were dueling furiously. Eventually Kass was able to gain the upper hand and Jeran was forced to keep backing away. Slowly they began approaching the edge of the Citadel. Soon they were right at the precipice. And with one last desperate lunge, Jeran slipped from the side and was lost from sight. Yet, there was no time to celebrate the small victory. Suddenly another figure rushed into the chamber. I knew who this was. I had been taught the history of the Darigan Citadel and recognized Lord Darigan immediately. "It is time to give me back my throne Kass," hissed the figure. Kass stood in shock for a moment. "I thought you were dead!" "I thought I was dead too," replied Darigan. "But I am not. I am here to reclaim what is rightfully mine. Stand down." Kass snarled in reply. "No. This is my kingdom now," and he leaped at Darigan. Each fought furiously, and it looked like Kass was going to win. He managed to corner Darigan into a wall, but Kass was tired from his battle with Jeran. He was unable to dodge the blow that knocked him to the floor. His amulet shattered when it hit the ground and, for a moment, Kass just stared at it, stunned. As though breaking the amulet had decided the battle, Darigan said something to Kass so softly that I couldn't quite hear it and then offered Kass his hand. But the Eyrie brushed it off brusquely and took off running to the interior chambers, Darigan hot on his trail. I followed behind as closely as I could without being detected. Then, when we entered the innermost chamber, the strangest thing happened. My Lord Kass fell to his knees and began begging for his own life! I could not see who he was talking to, but he sounded so desperate. Even Lord Darigan himself stopped in his tracks to watch. I was horrified! I had no idea what was going on and I wanted to rush to his aid, but I could not pull myself from behind the pillar where I was hiding, so frightened I was. Suddenly, Lord Kass, my father, turned his head and looked directly at me. For a moment his eyes met mine and then... A bright burst of light- he was gone. For a moment, I could not bring myself to move. What had happened? My eyes burned with tears, but I would not allow myself to cry. I knew I had to get out of there so as quickly and quietly as I could, and I winged out the nearest window and down along the ground. As I flew, wretched bright beams of sunlight began to stretch over the horizon. It was dawn. During my escape, I had the misfortune of flying over a certain blue Lupe who had managed to survive his fall. I was soon caught by the Meridell Army before long and was tried for my crimes. When King Skarl realized what I had done, he was furious. I was exiled from both Meridell and my own Darigan Citadel and was forced to wander Neopia alone. Before I left, I was painted ghost as a sign of my crimes and as a reminder that I was now just a shade of my former self, without any stability or home. In the bright light of day, I almost seemed to fade away. That night, as I was hiding in the woods, I had a strange dream. Some mysterious, shady beings called The Three were calling to me, Oyer... We can help you... We can help you get revenge for your father! We can bring him back and we will lead you to justice! Lord Darigan will fall to you! Follow us, Oyer, you must follow us! You can't know how appealing the voices that called to me in my dreams were. I must follow them. We will get the revenge we deserve. For now, I am content to wander Neopia and lie in wait, biding my time. And when The Three call on me again, I will be ready. I will fight once more! No, I am not sorry. One day we will be back. And Neopia had better watch out because next time, we will not fail. We will win. I will win and, in doing so, redeem my father. Count on it. "Air Faeries are known for being a little flighty..."